Most of us have a favourite pair of jeans that we wear time and again, but if we’re honest we probably also have quite a number of other pairs which we never wear because they’re just not quite right. Shopping for new jeans can be time-consuming, frustrating and sometimes demoralising but is certainly worth the effort. Very much a wardrobe staple, jeans can be worn for all sorts of occasions and never go out of style. The right pair of jeans can do wonders for your bottom and legs but the wrong ones can make you look dumpy and shapeless. When buying jeans you need to take into account the size of your waist in comparison to your hips, the depth of your “rise” and the length and slimness (or otherwise) of your legs. Lean columns/boyish shapes with little waist definition and slim legs, can carry off “skinnies” and “boyfriend” style jeans. 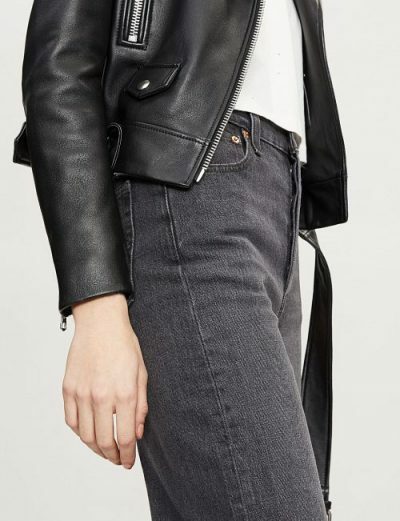 They can also handle lots of pockets and embellishment and get away with a lighter “stone wash” denim. Those with long legs will also look good in crops or “ankle grazers”. Hourglass and pear shapes will probably have difficulty getting jeans that are a snug fit on the waist yet still accommodate full hips. If you are quite curvy, a relatively high Lycra content will be helpful in providing a good fit. A bootleg cut will balance out the width at your hips and thighs and is generally more flattering than a skinny leg. Baggy, relaxed styles “boyfriend” jeans will only hide your curves and make you look bigger so are best avoided. Ovals/apples – ie those with a full tummy and no waist, generally find well-fitting jeans difficult to buy. If you can bring yourself to try them, you might actually find that maternity jeans offer a good fit and comfort. If you wear a long top (always more flattering on Rounds than tucking in), no one will be any the wiser! If, like many apples, your legs are quite long and slim, you could try a tunic top over skinny jeans. A low rise jean can work well on slim women with short bodies. On the whole though, if you’re carrying a bit of extra weight around the midriff, a higher rise will be more flattering, particularly on those with longer bodies. Levi Strauss are now doing a high-rise “ribcage” jean (pictured) which is particularly good for combating a muffin-top. Longer legs and perter bottoms! Create the illusion of longer, leaner legs by wearing your jeans as long as possible (straight leg and bootcut jeans lend themselves to this more than skinnies) and ideally with heels. If there is shading on your jeans, make sure it isn’t making your legs look bigger than they really are. A uniform dark-wash denim will always have a slimming effect. Back pockets positioned relatively high on your bottom will make it look higher and more “pert” whereas low slung pockets have the unfortunate effect of making your bottom look low slung too! Larger pockets create the illusion of a smaller bottom. Be open-minded about where you shop for jeans. The most important consideration is not the label, it’s how you look in them. Your perfect jeans can do wonders for your figure and are very much a wardrobe hero. Personally, I like Uniqlo for inexpensive jeans. Being a shortie, I especially appreciate the fact that if you buy in-store they will generally shorten them for you free of charge within a couple of hours. If you’re taking a trip to London, Donna Ida and Trilogy offer a good range and great customer service. NYDJ “Not Your Daughter’s Jeans” (available in john Lewis and elsewhere) are cut for a womanly shape and are very flattering as their “lift tuck technology” provides good tummy control, and bottom shaping. They’re relatively expensive (circa £150) but you will be able to wear them endlessly so they represent good value on a “cost per wear” basis. It’s worth taking time to find your perfect jeans so be prepared to try on lots of different brands in multiple sizes until you find the ones that are right for you. This entry was posted in Blog and tagged clothes, Friendtex, jeans, shopping. Bookmark the permalink.